“In looking for people to hire, you look for three qualities: integrity, intelligence, and energy. And if they don’t have the first, the other two will kill you.” The American investor Warren Buffet’s words of advice struck a chord. 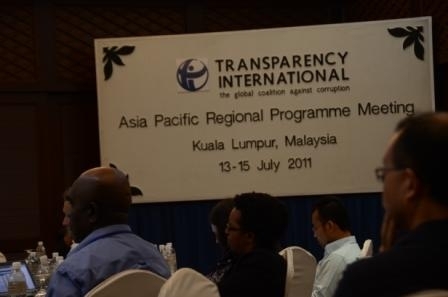 His words were quoted by another man intimately familiar with the world of business, K.M.Lee, Managing Director of Top Glove, the world’s largest rubber glove manufacturer, who joined Transparency International (TI) for an event on corruption in the private sector. Integrity and leadership came up again and again as participants laid out what is needed to put corruption out of business. Mr. Lee proudly described how Top Glove staff around the world wear a badge at work saying no to corruption. Simple but apparently effective, the badges send a clear message. The company also posts a letter twice a year to suppliers and contractors confirming their commitment to integrity and urging them to return a countersigned copy. Top Glove’s internal newsletter features news articles on corruption to show the consequences that cutting corners with integrity can have – whether it is losing a good job or bringing shame on the family. “I’m not Batman” announced fellow speaker Ravindran Devagunam, Director of Malaysia’s Fighting Corruption Performance Management and Delivery Unit, describing how it is not enough to simply go after the bad guys. Successfully fighting corruption, he argued, requires much more, namely will from the top to put in place the right laws and policies. A law protecting whistleblowers and the establishment of dedicated corruption courts were two examples he gave of the unit’s efforts to create an environment in which corruption cannot thrive. Corruption in the private sector is not just companies’ fault said Datuk Paul Low, Chair of TI Malaysia, responsibility also lies with the politicians and laws of a country. Malaysia’s score of 4.4 out of 10 in our Corruption Perceptions Index, which measures how corrupt a country’s public sector is seen to be, acts as a deterrent to foreign investors, asserted Mr Low. The government appears to be in agreement. It now uses the index score as a Key Performance Indicator and has asked TI Malaysia for guidance on what action is needed to improve. Last year, the country’s Ministry of Finance directed all government agencies to integrate our Integrity Pacts (agreements between government agencies and bidders for a public sector contract to abstain from corruption) into their public procurement procedures. Michael writes from just outside of Kuala Lumpur in Malaysia, where Transparency International representatives and partners from 23 Asia Pacific countries are currently gathered for our 2011 Asia Pacific regional meeting.